Preface. Computability. The arithmetical hierarchy. Languages and structures. Ordinals. 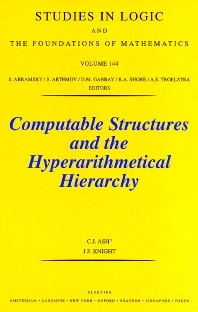 The hyperarithmetical hierarchy. Infinitary formulas. Computable infinitary formulas. The Barwise-Kreisel Compactness Theorem. Existence of computable structures. Completeness and forcing. The Ash-Nerode Theorem. Computable categoricity and stability. n-systems. &agr;-systems. Back-and forth relations. Theorems of Barker and Davey. Pairs of computable structures. Models of arithmetic. Special classes of structures. This book describes a program of research in computable structure theory. The goal is to find definability conditions corresponding to bounds on complexity which persist under isomorphism. The results apply to familiar kinds of structures (groups, fields, vector spaces, linear orderings Boolean algebras, Abelian p-groups, models of arithmetic). There are many interesting results already, but there are also many natural questions still to be answered. The book is self-contained in that it includes necessary background material from recursion theory (ordinal notations, the hyperarithmetical hierarchy) and model theory (infinitary formulas, consistency properties).